Everyone needs a few recipes to keep on hand for quick meals throughout the week. It’s so much fun to cook up extravagant entrées, but sometimes an easy, nutritious meal is a better use of time and energy. Our @cbdsuperfood Golden Spiced Rice is a great recipe to keep close by for busy nights! It’s full of flavor, and you can double or even triple the recipe to get a few lunches out of a batch. Best of all, it doesn’t take long to make! Flavored with our @cbdsuperfood x @goddess.ghee Golden Spiced Ghee, it’s also full of anti-inflammatory benefits. As we shift into cooler fall weather, this meal is a good option to combat inflammation that can arise during weather changes. Prepare rice and set aside. In a small pan, toast chopped raw almonds in oil of choice until they are lightly browned. 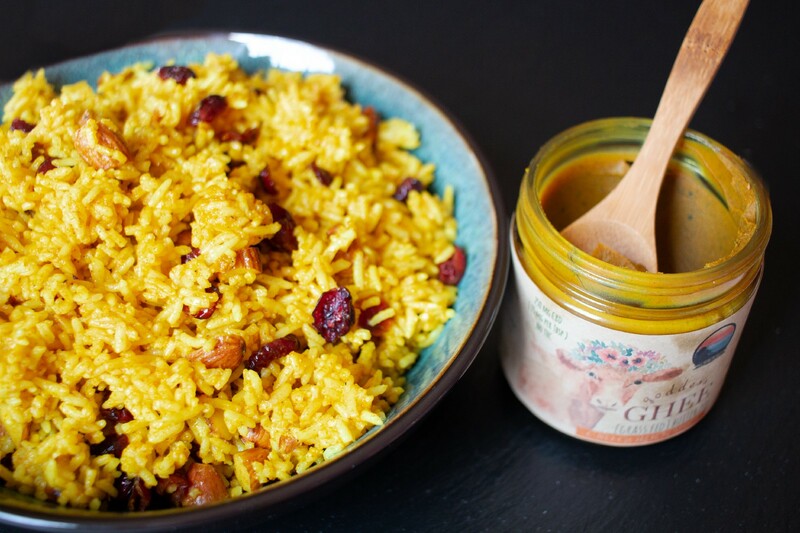 Once the almonds are toasted, turn off the heat and add cooked rice, cranberries and @cbdsuperfood x @goddess.ghee Golden Spiced Ghee into the pot with the almonds. Add small amounts of water if necessary. Enjoy!